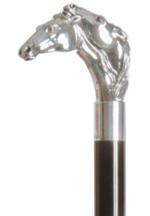 A charming formal cane, featuring the heads of two spirited horses. The tapered shaft is hardwood, lacquered a very shiny black for a smart appearance. This cane may be used for light balance but is not suitable for heavy use or orthopaedic support. Care should be taken not to drop the cane to avoid denting the handle or chipping the lacquered shaft. The cane is fitted with a smart brass ferrule, over which a non-slip rubber ferrule may be fitted if required. The overall height of the cane is 92cm (36"). Ferrule diameter 13mm.